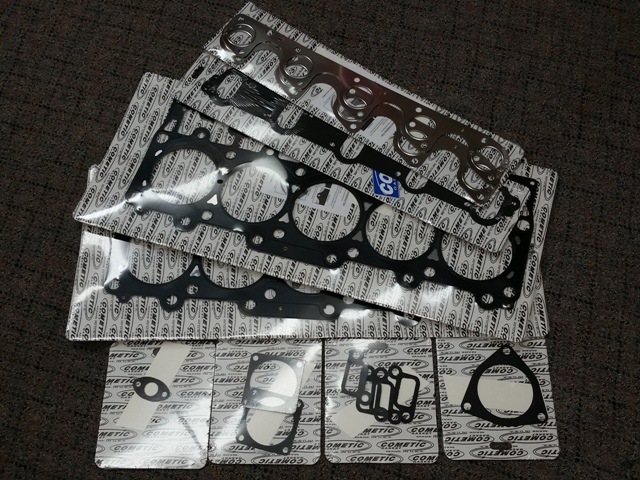 This is a complete "Gen-1 Head Gasket Replacement Package" which includes all of the gaskets necessary to replace a set of STANDARD SIZED head gaskets. All gaskets are either MLS of AFM construction, and considered an upgrade gasket for the application, completely eliminating composite gaskets from the Gen-1 engine service. If you are in need of a gasket other than standard size, please notify us in the Comment Box when checking out. Valve Cover Gaskets are NOT INCLUDED, as they are generally reusable and quite expensive. If yours are cracked or otherwise damaged, please purchase them separately to add them to your order. Please also see our Lower Gasket Package to complete a full engine gasket set. -Proper torque for MLS head gaskets is different than original specification. Proper spec and sequence is 40lbs-80lbs-120lbs-120lbs in an outward spiral sequence from center cylinder. DO NOT skip secondary 120lbs sequence, as embossing will not be fully compressed on the first few bolts torqued on the first 120lbs sequence.